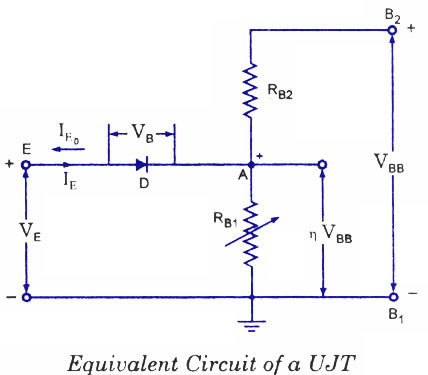 In this article, we learn about UJT (Uni Junction Transistor) in detail. We cover a lot about UJT like – what is basically a UJT, how they differ from other transistor models, how to construct a UJT, operation & working of a UJT, how to build applications of UJT and so much more. Lets dive into details of Uni Junction Transistors. Unijunction transistor (abbreviated as UJT), also called the double-base diode is a 2-layer, 3-terminal solid-state (silicon) switching device. The device has-a unique characteristic that when it is triggered, its emitter current increases re generatively (due to negative resistance characteristic) until it is restricted by emitter power supply. The low cost per unit, combined with its unique characteristic, have warranted its use in a wide variety of applications. A few include oscillators, pulse generators, saw-tooth generators, triggering circuits, phase control, timing circuits, and voltage-or current-regulated supplies. The device is in general, a low-power-absorbing device under normal operating conditions and provides tremendous aid in the continual effort to design relatively efficient systems! The basic structure of a unijunction transistor is shown in figure. It essentially consists of a lightly-doped N-type silicon bar with a small piece of heavily doped P-type material alloyed to its one side to produce single P-N junction. The single P-N junction accounts for the terminology unijunction. The silicon bar, at its ends, has two ohmic contacts designated as base-1 (B1) and base-2 (B2), as shown and the P-type region is termed the emitter (E). The emitter junction is usually located closer to base-2 (B2) than base-1 (B1) so that the device is not symmetrical, because symmetrical unit does not provide optimum electrical characteristics for most of the applications. The symbol for unijunction transistor is shown in figure. The emitter leg is drawn at an angle to the vertical line representing the N-type material slab and the arrowhead points in the direction of conventional current when the device is forward-biased, active or in the conducting state. The basic arrangement for the UJT is shown in figure. A complementary UJT is formed by diffusing an N-type emitter terminal on a P-type base. Except for the polarities of voltage and current, the characteristics of a complementary UJT are exactly the same as those of a conventional UJT. The device has only one junction, so it is called the unijunction device. The device, because of one P-N junction, is quite similar to a diode but it differs from an ordinary diode as it has three terminals. 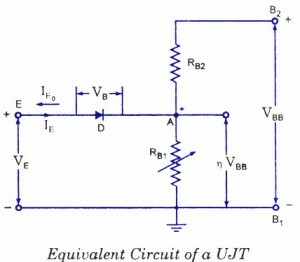 The structure of a UJT is quite similar to that of an N-channel JFET. The main difference is that P-type (gate) material surrounds the N-type (channel) material in case of JFET and the gate surface of the JFET is much larger than emitter junction of UJT. In a unijunction transistor the emitter is heavily doped while the N-region is lightly doped, so the resistance between the base terminals is relatively high, typically 4 to 10 kilo Ohm when the emitter is open. The N-type silicon bar has a high resistance and the resistance between emitter and base-1 is larger than that between emitter and base-2. It is because emitter is closer to base-2 than base-1. UJT is operated with emitter junction forward- biased while the JFET is normallyÂ operated with the gate junction reverse-biased. UJT does not have ability to amplify but it has the ability to control a large ac power with a small signal. It exhibits a negative resistance characteristic and so it can be employed as an oscillator. Imagine that the emitter supply voltage is turned down to zero. Then the intrinsic stand-off voltage reverse-biases the emitter diode, as mentioned above. If VB is the barrier voltage of the emitter diode, then the total reverse bias voltage is VA + VB = È VBB + VB. For silicon VB = 0.7 V.
Now let the emitter supply voltage VE be slowly increased. When VE becomes equal to È VBB, IEo will be reduced to zero. With equal voltage levels on each side of the diode, neither reverse nor forward current will flow. When emitter supply voltage is further increased, the diode becomes forward-biased as soon as it exceeds the total reverse bias voltage (È VBB + VB). This value of emitter voltage VE is called the peak-point voltage and is denoted by VP. When VE = VP, emitter current IE starts to flow through RB1 to ground, that is B1. This is the minimum current that is required to trigger the UJT. This is called the peak-point emitter current and denoted by IP. Ip is inversely proportional to the interbase voltage, VBB. Now when the emitter diode starts conducting, charge carriers areÂ injected into the RB region of the bar. Since the resistance of a semiconductor material depends upon doping, the resistance of region RB decreases rapidly due to additional charge carriers (holes). With this decrease in resistance, the voltage drop across RB also decrease, cause the emitter diode to be more heavily forward biased. This, in turn, results in larger forward current, and consequently more charge carriers are injected causing still further reduction in the resistance of the RB region. Thus the emitter current goes on increasing until it is limited by the emitter power supply. Since VA decreases with the increase in emitter current, the UJT is said to have negative resistance characteristic.Â It is seen that the base-2 (B2) is used only for applying external voltage VBB across it. Terminals E and B1 are the active terminals. UJT is usually triggered into conduction by applying a suitable positive pulse to the emitter. It can be turned off by applying a negative trigger pulse. Hi! I am very happy to get my problems in this website, but i wanna to know why VB=0.7v is alway constant….???????? Vb=0.7 because that is PN junction just like diode,and that is junction’s drop. Hi sir! I am very happy to get my problems in this website, but i wanna to know why VB=0.7v is alway constant….???????? È = (RB1 ) / (RB1 + RB2 ) which is intrinsic stand off ratio. it lies between 0.4 to 0.85. RB1 is the resistance between B1(base 1) and point A.
RB2 is the resistance between B2(base 2) and point A. Consider, if emitter is open, then the total resistance RBB is equal to the resistance of the N type material used which is ver high upto 10 kilo ohm. why at Vv only it stops??? i want to konow about È . how can find out its value? if i have a ujt and i have to determine its È ,then how can i find out? Sir I want picture of forward & reverse bias pn junction operation of UJT. Hai friends ! How prepare 4 th semester exam !GOOGLE SEARCH ” adirai musthafa ” easy to get my photos . . . . .8148529602 it’s my number . . . Send your email id . . I am true chat with “U” . . And true friendship with “U” . . . . .thank you . . .
GOOGLE SEARCH ” adirai musthafa ” easy to get my photos . . . . .8148529602 it’s my number . . . Send your email id . . I am true chat with “U” . . And true friendship with “U” . . . . .thank you . . .
very much thank u ! ! ! ! ! ! hey thanks… for the help…it helped me alot in making my project. thanks sir…for such a gud description…it was very needed for me. Thanks for such an informative website. When I grew up UJT was already out of fashion but I got to use it a number of times, without really understanding it. Now, the information about UJT is very rare… I found your comparison against n-ch J-FET to be very useful.